Anyone selling a house often uses a stylist to ensure the home looks lived in and loved. The same thinking should be applied when trying to sell or lease commercial property space in a city centre. That is the view of Renew Newcastle general manager Christopher Saunders, who was in Mackay outlining how that New South Wales city has rejuvenated its CBD “one empty space at a time”. Newcastle has been transformed in the past decade by the Renew Newcastle project, based around activating otherwise empty retail spaces with innovative and creative projects. Mr Saunders, who briefed councillors on Wednesday and real estate agents this morning, said an empty commercial space could be hard to market as it gathered cobwebs and mail piled up. But he said activating that space by providing it at little or no cost for a creative project “cleans away those cobwebs, gives a fresh paint of coat, creates some activity”. Mr Saunders said reducing rents wasn’t the answer to empty shops in CBDs. “You can’t reduce rents. If you do that, you devalue the property,’’ Mr Saunders said. The Renew Newcastle model was based on providing “licences” for the use of empty shopfronts, rather than leases, he said. Those who have a licence to use a property become its custodian and take a sense of pride in the space. In Newcastle, there were about 260 activations of empty commercial spaces in the CBD. “The enthusiasm was there to make something out of that space,’’ Mr Saunders said. “It brought the city alive, it shone a spotlight on the city, it brought investment from outside,” he said. The Renew Newcastle model, or variations of the model, are now used by 39 communities around Australia and nine international communities. Mr Saunders, who will return in a couple of weeks for a follow-up visit, said Mackay was a “perfect fit” for a similar community-driven model. “You’ve got concern about a high level of vacancies in the CBD. You’ve got a city grappling with its own identity,’’ he said. Mayor Greg Williamson said council brought Mr Saunders to Mackay to provide some new ideas on how to reenergise the City Centre. “This is not a council-down (initiative). This is a ground-level up movement,” he said. Cr Williamson said the nature of retail in CBDs had been changing for a long time, so innovative solutions were needed, such as enticing home-based businesses to move into empty shopfronts. He said council could play a part through its planning scheme and the new Mackay Waterfront PDA to encourage people to live or work in the CBD. Cr Williamson said council was assisting by bringing Mr Saunders to town, aiming to form a committee of landlords, or “Mackay investors”, and getting real estate agents together. He said Mackay couldn’t expect a rejuvenation of the City Centre overnight, but the Newcastle experience in the past 10 years showed what was possible. “They’ve got a city now listed by Lonely Planet as one of the top 10 cities to visit in the world. 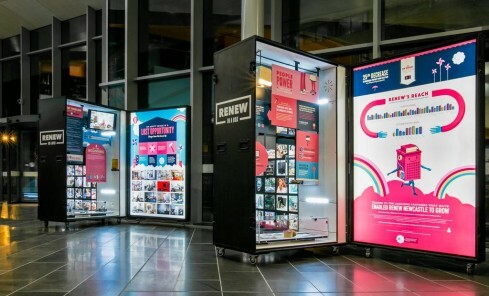 A travelling exhibition presented by Renew Newcastle, titled Renew in a Box, is on display in The Dome until September 19. Renew in a Box is described as a visually superb piece of art which tells the Renew story to inform and inspire potential property owners and local decision makers to see how an empty space is a missed opportunity. Viewing times are 7.30am to 6pm on Mondays, Tuesdays, Wednesdays and Fridays, 7.30am to 8pm on Thursdays and 7.30am to 3pm on Saturdays.